Beyond the narrow limits of the family, affection may extend within a wide circle of friendship. The Man-God was pleased to have friends on earth, and He has deigned to assemble them around Him in heaven. Fol­lowing His example, the holiest persons have given free vent to the tenderest feelings of their hearts: all have had friends, chosen out of a thousand, and all have rejoiced in the thought of knowing and loving them in eternal repose. Now, one of the joys of these true friends will be their mutual recognition. St. Ambrose thought so when he commented on the following words of our Savior: “I have called you friends, because all things whatsoever I have heard of my Father I have made known to you” (John 15:15). By these words our Lord has given the model of friendship for us to copy. We must reveal to our friends all the secrets of our hearts, and we must not remain in ignorance of theirs. A friend conceals nothing. If he is sincere, he opens his mind as our Savior disclosed the mysteries of His Father. With whom shall we be in heaven? With God, who is our Father; with Jesus Christ, who is our Brother; with the Blessed Virgin, who is our Mother; with the angels and saints, who are our friends. A king, in his last moments, said with deep regret: “Must I then quit my kingdom to go into a country where no one is known to me?” He had never thought of the happiness of heaven. We must make friends there henceforward, in order that we may meet them after death; and then we shall not be afraid, like that king, of not knowing anyone in the other world. This article is from “In Heaven We’ll Meet Again.” Click image to preview or order. It appears to you, perhaps, that until now I have spoken only of that general friendship that will exist among all the saints in heaven, as it exists on earth, among all the good who know and appreciate each other; and, still more, among all the religious who live in the same community. But does not what I have said apply with greater force to a special and holy friendship sometimes seen to blossom during time between two hearts, by virtue of the blood of Jesus Christ? Firmly believe that such a flower, after having formed your delight on earth, will shed its odors in a blessed eter­nity, to perfume the celestial court, and to give ever-new consolation to the elect. The saints even considered the possibility of such persistence as an essential of friendship. Who does not know that saying of St. Jerome, “The friendship was never true that can have an end”? The friendship that cannot be eternal has no real existence, and true friendship survives all separations of death, to reunite in heaven those whom she unites on earth. If your reciprocal communication is made up of charity, of devotion, of Christian perfection, O God! How precious will your friendship be! It will be excellent, because it came from God; excellent, because it tends to God; excellent, because its bond is God; excellent, because it will last forever in God. Oh! How pleasant it is to love on earth as they love in heaven and to learn mutually to cherish one another in this world as we shall do throughout eternity in the next! The delicious balm of devotion distills from heart to heart by continual participation; and so it may be said that God has extended His blessings and the life of ages upon ages over such friendship. Never did so chaste a tie change but into a union of spirits more perfect and more pure — a living image of the blessed friendships to exist in heaven. Let us, at all times and in all places, remember and pray for one another; let us strive to soften our pains and anguish by our mutual love; and if one of us, through the goodness of God, precede the other to heaven, may our friendship continue in the presence of God, and our prayers unceasingly implore the mercy of our Father in favor of our brothers and sisters. But some may be found who will endeavor forcibly to repress all these sentiments of a loving heart and who will make you this reproach: “What! Is it not a manifest and gross imperfection to rouse your courage and to stimulate yourself in your struggle with the world, by the hope of reposing on the bosom of those whom you love?” You may reply, madam, that there have been great saints who were even more sensible than you to this hope and that they desired to enjoy again, in a blessed eternity, the chaste embraces of their friends. You say in the excess of your friendship for me, that you would most ardently wish to see me once more before you die. Oh! God alone, who looks into the heart, knows how vivid and how deep an impression this dear proof of your affection has made on my soul. Each time I recall it — and that happens often — my eyes involuntarily fill with tears; and if the delightful idea that I could embrace you once more presents itself to my mind (for, however difficult it might appear at first sight, there is nothing that holy obedience cannot accomplish), I find myself for an instant surprised by a torrent of tears that no power can arrest. I pray God that if we are not to see each other again while living, we may together enjoy in a happy eternity the repose never to be found in this life. It is all over; we never shall meet again on earth otherwise than by letters; but in heaven — ah! We shall meet face-to-face. And then with what transport shall we not embrace one another! Who, indeed, can tell the transports which two virtuous friends will experience for each other eternally in heaven, after having here below loved each other unto perfection, and verified the saying of Holy Scripture: “A faithful friend is the medicine of life and immortality; and they that fear the Lord shall find such a friend” (Sir. 6:16)? Editor’s note: This article is adapted from a chapter in In Heaven We’ll Meet Again, which is available from Sophia Institute Press. By François René Blot, S.J. 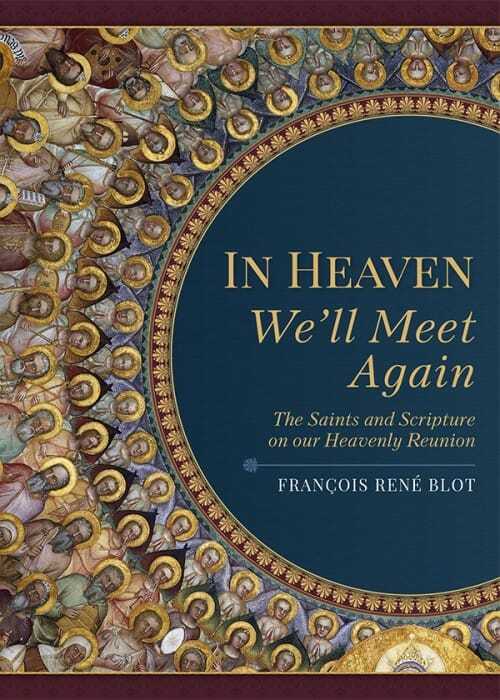 François René Blot is the author of In Heaven We'll Meet Again, which is available from Sophia Institute Press.